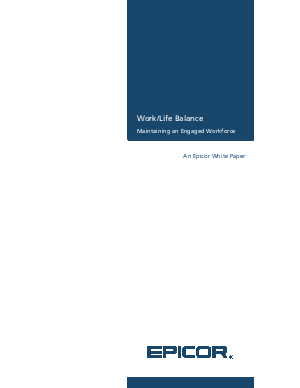 “Eighty-six percent of workers say work/life balance and fulfillment are top career priorities.” Unfortunately, only twelve percent of organizations believe work/life balance and fulfillment are important to hiring and retention. As yesterday’s latchkey kids become today’s professionals, helping employees establish a solid work/life balance is essential to creating and maintaining an engaged workforce. Not only does encouraging work/life balance help employees become more engaged and productive, but it can also reduce stress levels and create a healthier workforce. As technology has advanced, the line between the personal and professional has blurred. By utilizing the appropriate technology, it is easier than ever to find innovative ways to help employees do their jobs while managing to focus on their lives outside the office. What does it take to have a healthy and happy workforce? There are several things organizations can do to help employees have a quality work/life balance while remaining productive. From schedule flexibility to different types of leave, organizations can work with employees to find what works best for both parties.